Can you spot a bargain? Yesterday I was shopping in Tesco. 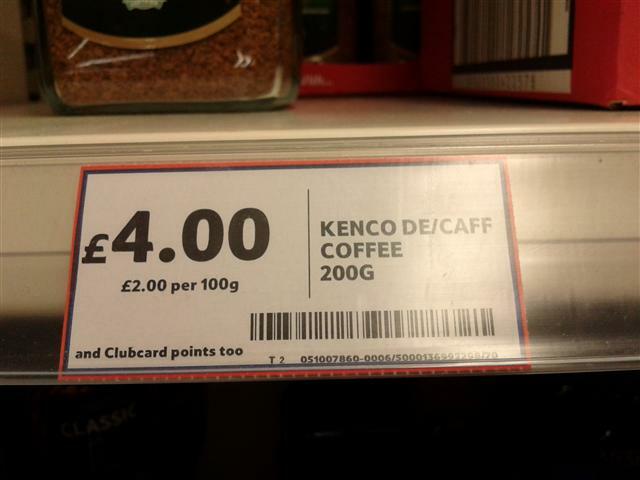 On my list was Decaf coffee, and I know that my son likes Kenco. I am busy, and I didn’t really want to have to spend a lot of time thinking about it, but when faced with the choice of either buying a jar or a refill pack, I had to stop and think! Surely the refill pack for £3.00 was a bargain! After all, it is normally £4.99, almost a pound more than the jar. But I knew that the lid on our jar at home was showing signs of wear, so how much was I really saving by buying a refill? Was it worth replacing the jar? I stood there doing the maths. I knew that the labels both said that it was £2.00 for 100g, but I was confused. Did that refer to the pre-discounted price? Surely the £3.00 for the refill pack would save me a pound? No, the refill pack was 50g smaller than the jar, and pound for pound the two items cost the same, but one was explicitly marketed as a saving of £1.99 – and of course will run out quicker, bringing you back to the store for more “bargains” more often. It’s time we took a stand and told our supermarkets that we are no longer prepared to be treated like that. We don’t have to give them our money! 2 Responses to Can you spot a bargain? 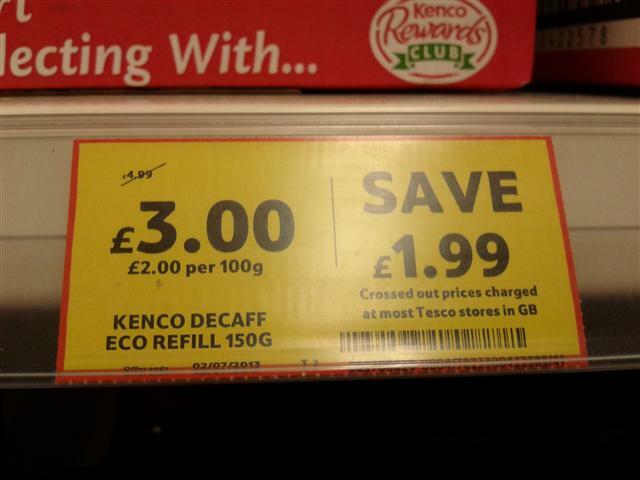 That’s why I stopped shopping at Tesco; my weekly shop took me nearly 2 hours if you want to be price-savvy. Sainsbury’s is marginally better/more transparent with their pricing..
Ah yes, capitalism hard at work 😉 In general, my shopping rule is: if it looks like a bargain, it usually isn’t.